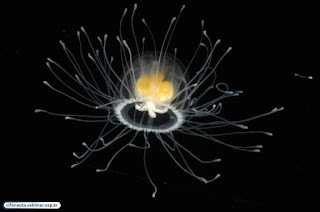 It's in the class Hydrozoa, like Hydras and Blue Buttons (also Portuguese Man o' War, but I must have linked to that a million times by now) rather than Scyphozoa, which is where your classic jellyfish like the Lion's Mane and everyone's favourite Moon reside. 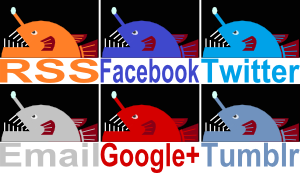 The lifecycle of the two groups are often quite similar. Male and female jellyfish release gametes, eggs become larval planulae that seek out a surface to rest on before becoming a polyp. 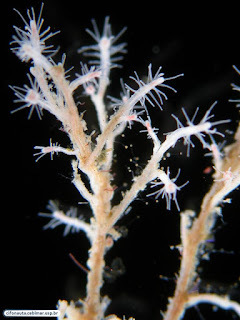 But Hydrozoan polyps are called hydroids and they are usually colonial. 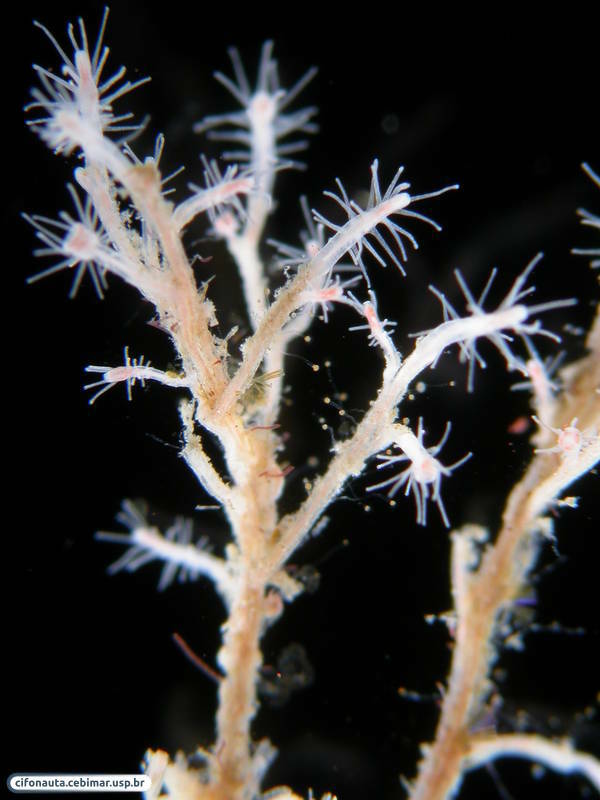 They make up a little tree, with polyps all connected to each other by a tube. The Immortal Jellyfish uses a stolon that runs along the ground like strawberry runners. It's just that the stuff that grows up from them are polyps with stinging tentacles rather than juicy fruit. Ah, well. The hydroid colony now releases tiny jellyfish, or medusoids, that are just a millimetre across. They feed on plankton and grow to a maximum size of about 4.5 millimetres (0.18 in) after 2 to 4 weeks. They are now sexually mature and can reproduce in the usual way, but something extraordinary happens if conditions become unfavourable. You might remember that the Salp was a weird creature that would reproduce until there was no food left and then they'd all die. The Immortal Jellyfish is little more clever than that. An adult will actually revert back into a polyp, absorbing the tentacles and the jellyfish bell as it reattaches itself to the ground. It now extends those same stolons to make a whole new hydroid colony. Lab experiments showed that they will do this as a result of starvation, temperature change or drops in salinity. They can also do this at any stage of jellyfish development, from being a tiny thing 1 mm across to a not quite as tiny, sexually mature adult. It's quite remarkable because cells have to transform into completely different kinds of cells. And of course, if they can do this ad infinitum it would mean they are biologically immortal! All they have to do is avoid getting eaten. But then again, don't we all? 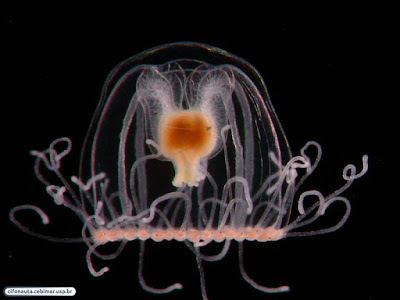 These jellyfish are found all over the tropical and temperate world, perhaps spread by boats using water ballast. Dr. Maria Pia Miglietta of the Smithsonian Tropical Marine Institute said "we are looking at a worldwide silent invasion". It is clear. This world is a Jellyfish World. Just like all those other ways that the world or humanity is going to end: It's not if... it's when. Who would've thought that would be the answer to eternal life? Ha, yeh! It looks like the ominous sight of egg flying through the air towards your face. Better than a jellyfish to the face, I think!